In modern usage, the original meaning of the word “democracy” has been camouflaged. Whereas most folks understand it to mean electing our leaders and having a say in the affairs of our government, that is not what democracy means. The hard reality is more insidious: the word democracy comes from the Greek word dēmokratiā, which was coined from dēmos (“people”) and kratos (“rule”). 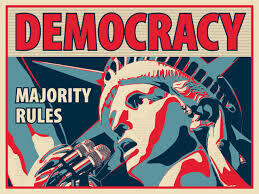 Democracy literally means “the peoplerule.” We interpret that as “majority rule.” That sounds pretty good, right? Isn’t that what we are supposed to have in America? “Democracy is two wolves and a sheep voting on what’s for dinner. In a republic, the sheep is well armed and able to contest the vote.” – multiple attributions. Well, judging by the state of 237-year-old America today, it looks to me like the republic is giving way to democracy, but the transition is not complete, nor assured. Will we complete the transition and give in to dictatorship, or will “we the people” restore the republic? This entry was posted in Politics & Philosophy and tagged Constitution, Declaration of Independence, democracy, government, individual rights, majority rule, politics, republic, rule of law. Bookmark the permalink.